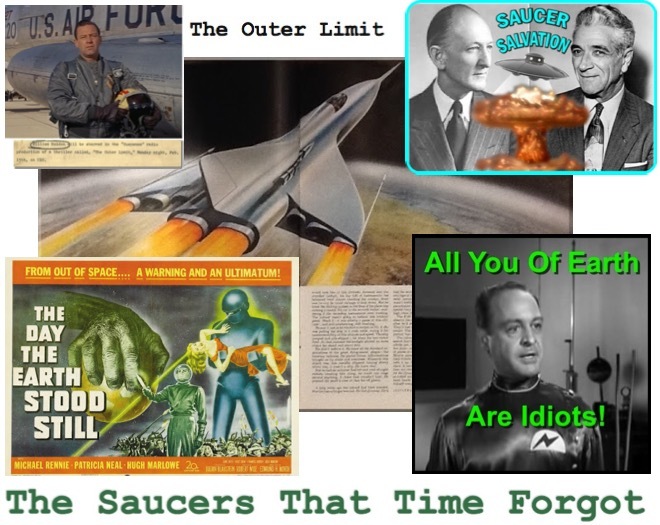 There's a companion blog to Blue Blurry Lines, one exclusively focused on the forgotten history, folklore and origins of ufology, The Saucers That Time Forgot. A close encounter with a UFO, an alien abduction, missing time, contact with an advanced benevolent extraterrestrial race, telepathic communication, and a dire warning to the Earth about the use of Atomic weapons. At least one adaptation of the story includes the use of hypnotic regression to recover memories of the encounter. It's a prophetic tale of a credible witness of a relatively incredible event, but the colonel in charge chooses not to believe, and there's the strong suggestion that the UFO report will be the subject of a cosmic cover-up. The series starts with the historical setting of the late 1940s, A-bombs and the arrival of the flying saucers, introduces the story itself, and shows how the tales was further spread through popular culture by being adapted into several radio and television programs, and how it was absorbed into ufology through George Adamski and the Contactees. The finale examines how it was imitated in several movies ranging from The Day the Earth Stood Still to Ed Wood's Plan 9 from Outer Space, and even echoed in much more modern films. Other articles focus on weird, warped, and sometimes fraudulent UFO cases that were newsmakers in their day, but lost through the cracks of time, forgotten- or perhaps even suppressed- by UFO historians. STTF is written by Curt Collins, with the support of Yvan Defoy, backed by the input of UFO buffs- and sages- both known and unknown, of this world and perhaps others. Fight the UFO cover-up. Read each and every installment of The Saucers That Time Forgot.